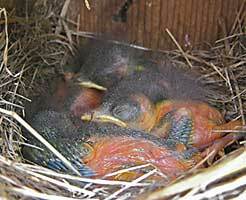 Day Nine in the life of four Eastern Bluebirds. Well, actually, one of these babies is only seven days old. Their feathers are coming in, and you don't see much pink skin any more. They're starting to look like real birds. As recently as yesterday, they were mostly bright pink. (Picture at right.) 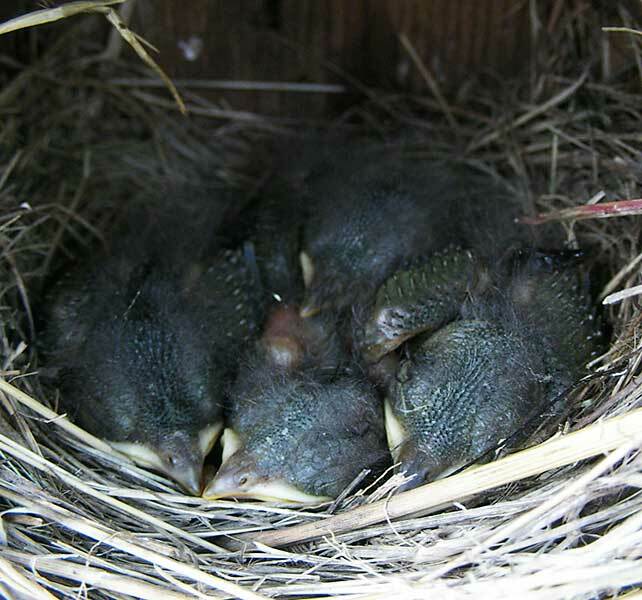 What a difference 24 hours makes in the life of a baby bluebird! 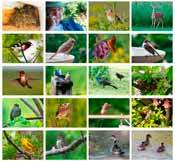 I can make out only four beaks in today's photo (at top). There was a fifth egg. I don't know if it ever hatched. 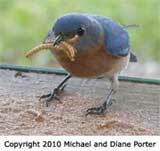 The mother bluebird seems to like the free mealworms I offer her every morning. I sit outside for awhile with mealworms on the table beside me. The female bluebird lands on the table, uttering little noises that sound like fragments of the bluebirds' soft song. She picks up as many mealworms in her beak as she can possibly hold. But she doesn't take them straight to the birdhouse. First she flies up on top of the roof, out of my sight. After about a minute, she delivers the mealworms to the babies in the birdhouse. Perhaps she doesn't want to give away the location of the nest to me.